Mix together the cake mix, 1 beaten egg, and margarine with a fork or pastry blender. It will be sticky. Press into bottom of 13×9 inch pan with fingers. In a mixer, combine cream cheese, powdered sugar and 2 eggs. Mix for 5 minutes. Pour onto the crust in the pan. Bake at 350° for 30 minutes. 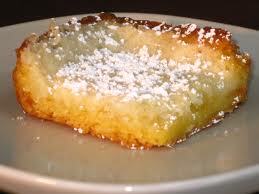 Cool slightly and sprinkle liberally with powdered sugar. Makes 12 servings.